Some days you want to stay inside. And some days you want to take the kids and go window shopping. Outdoors. Here are 4 Bay Area outdoor markets where you can enjoy the sun (or fog) and shop for treasures. This post originally ran first on Mommy Nearest. You know that island. The one in between San Francisco and the East Bay , where the Bay Bridge changes direction and style. You can get off there to go treasure hunting once a month at the Treasure Island Flea. There are 350 vendors, plus wine tastings (at least a dozen wineries), food trucks, live music, a farmer’s market and a maker’s area, with cheap/free DIY classes. When: Go to the fair the last full weekend of each month, Saturdays and Sundays. The next one is this weekend! Cost: Entry is $3 for adults, free for kids and pets. 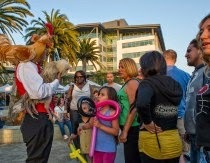 With a backdrop of the bay, make an evening of eating, watching street performers and browsing through crafts at Oakland’s Jack London Square. Family fun: Get there by bike or ferry! Kid fun might include hula hooping, pinball, magician shows and stilt walking. When: First Friday of the month, from 6-10 p.m. Your kid likes one food and you like another? Head over to SOMA Street Food Park to pick out your own food truck meal. The vendors change daily, with up to 10 available at any time. It’s pet-friendly and there’s free wi-fi. Cost: Free entrance, buy your own food. When you yell “look both ways when crossing the street,” you’ll be looking for bikers, walkers, runners, dancers and other movers. Not cars. Each month, several blocks of a different San Francisco neighborhood closes each month for a free festival, emphasizing outdoor fun. While there’s not a ton for sale here, they have lots of health and community vendors. Family fun: Free family-friendly activities include might include yoga classes, arts/crafts, instrument petting zoo, street entertainers, family bike parade and bike decorating. When: One Sunday a month in a changing San Francisco location. The next one is June 8 on the Great Highway.